Instructor Amy Bate practices tai chi movements outside the Grantsville Senior Center. She said the new class is for people who suffer from arthritis and helps with fall prevention. 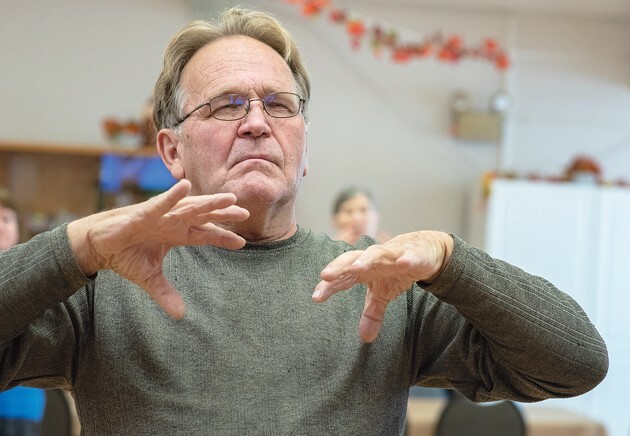 Roger Sawyer participates in a tai chi class taught at the Grantsville Senior Center on Mondays and Fridays. 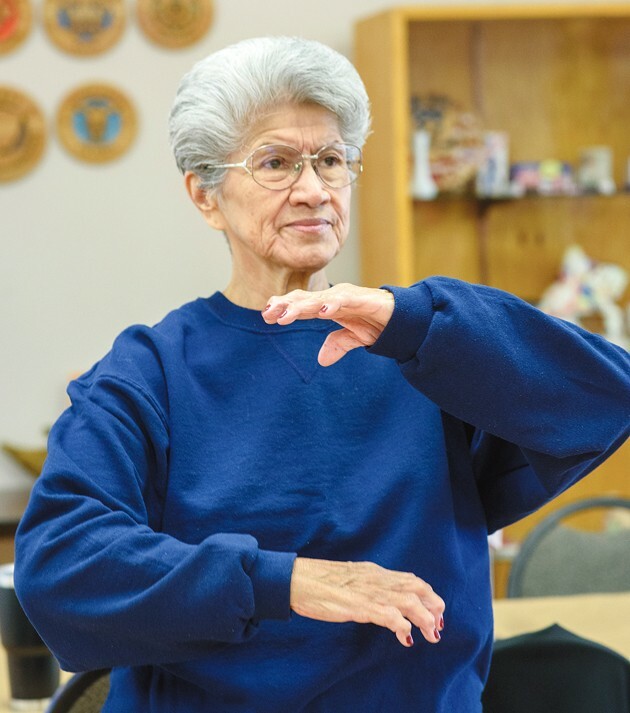 Sharon Bottelberghe participates in a tai chi class taught at the Grantsville Senior Center on Mondays and Fridays. 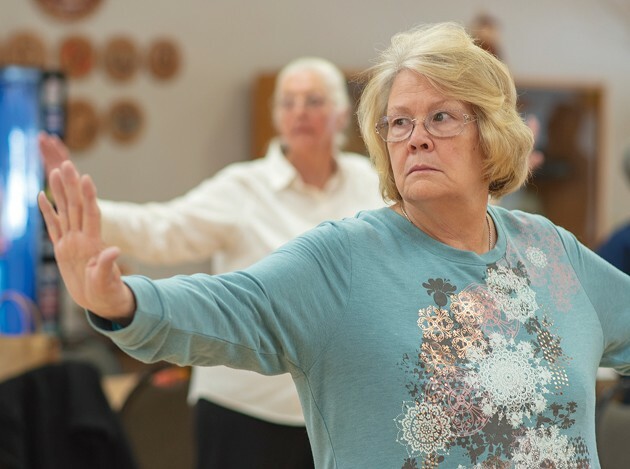 Kaye Sweeting participates in a Tai Chi class at the Grantsville Senior Center. Tai chi is attributed to a variety of healthy benefits, such as lowering blood pressure, improving balance and relieving pain. Bate leads a tai chi class at the Grantsville Senior Center. She said tai chi makes your whole mind, body and spirit feel better. The class is so popular, additional courses are already being planned, Bate said. Jan Ross participates in a tai chi class at the Grantsville Senior Center. 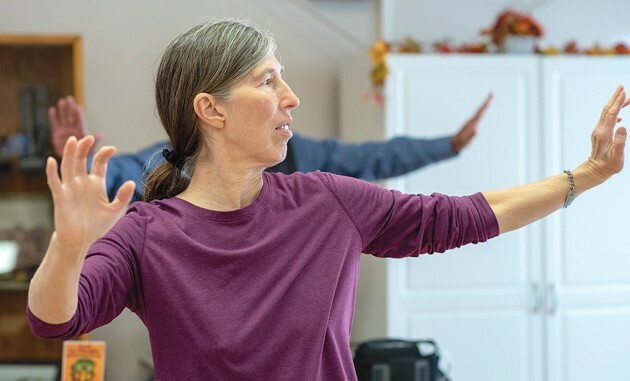 In a typical class, instructors lead participants through a warm-up exercise, teach a new tai chi form, practice forms that were already learned, and finish with a cool down. 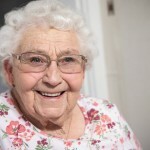 A new evidence-based class aimed at improving arthritis and preventing falls for seniors is gaining popularity in Tooele County. The class, titled “Tai Chi for Arthritis and Fall Prevention,” was developed by Dr. Paul Lam of the Tai Chi for Health Institute. The eight-week program is based on the Sun style of tai chi, and includes 12 forms of movement designed to build muscle strength and improve balance, said Amy Bate, health promotion coordinator and public information officer for the Tooele County Health Department. Bate, along with one other health department employee, became certified as instructors for the class in April after the Utah Department of Health offered funding for Tooele County to start the class. More than 500 medical studies on tai chi have shown the exercise can have a variety of health benefits, according to a video published by the Tai Chi for Health Institute. A recent study published in the Journal of Aging and Physical Activity in 2016 seems to support Lam’s claims. Out of 343 study participants — the average age of whom was 66 years — 83 percent showed significant improvement in balance after eight weeks of participating in tai chi classes. At the same time, participants reported less pain, fatigue, and stiffness. After a year of tai chi, the participants still felt the same benefits. When the study concluded, 30 percent of participants chose to continue doing tai chi. On a local level, Tooele resident Floyd Michael Lewis has enjoyed his experience in the senior centers’ tai chi classes. 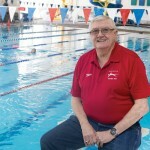 He was at the very first class on May 8, and has completed the eight-week course twice now. Learning the deliberate movements has been Lewis’ favorite part of the classes, and the aspect he feels helps him the most. In addition to doing tai chi at the Tooele Senior Center, Lewis bought a set of DVDs from the Tai Chi for Health Institute so that he can practice at home. In addition to staying active and learning to breathe properly, one of the major health benefits he’s noticed is lower blood pressure. 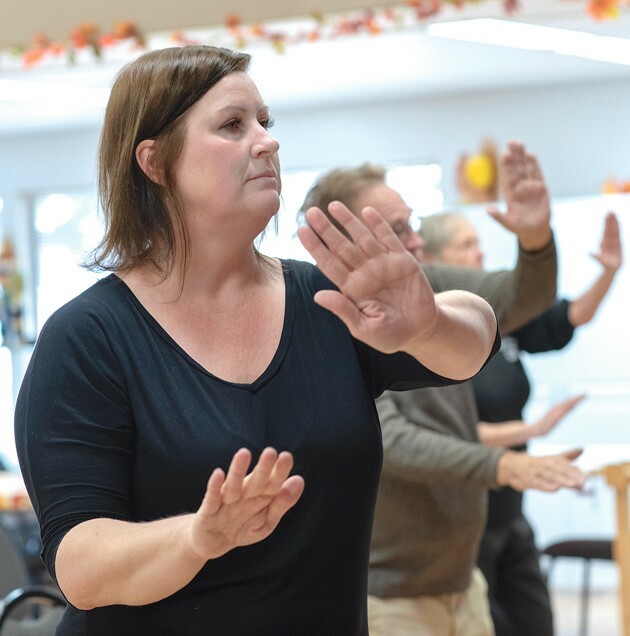 Lewis isn’t the only one enjoying the tai chi classes, according to Kristen Bolinder, Tooele Senior Center activities specialist and the other tai chi instructor in the county. According to Tooele County’s funding contract with the state health department, Bolinder and Bate were only required to teach two classes in the community. But since becoming certified instructors in April, they’ve already taught the full course twice at the Tooele Senior Center, and are currently teaching it again in Grantsville. 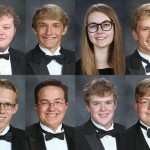 Each week, class members attend two one-hour classes. The current class meets at the Grantsville Senior Center on Mondays from 10 to 11 a.m. and Fridays from 9 to 10 a.m. In a typical class, the instructors lead the participants through a warm-up exercise, teach a new tai chi form, practice forms that were already learned, and finish with a cooldown. Each form builds on the previous ones, ultimately resembling a dance. The class structure is nice because if people ever have to miss a class, they don’t fall far behind, Bolinder said. For Bolinder, the most rewarding — and the most challenging — part of doing tai chi is learning to slow down. Bolinder and Bate agreed that one of the best aspects of tai chi for seniors is that people of all abilities can do it. Students can practice while sitting as well as standing. They have one student who does the exercises from her wheelchair. In addition, if someone struggles to do a particular form, they can choose to skip it and focus on the other forms. As the classes have progressed, Bolinder has noticed positive changes in her tai chi students. Between the class’ popularity and its health benefits, Bolinder and Bate don’t intend to stop teaching tai chi anytime soon. The next class in Tooele will most likely start next March. Each new class will be announced on the Tooele County Health Department website, in the department newsletter, on social media, in the Transcript Bulletin, and through flyers around the community. 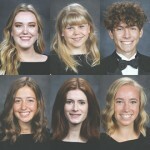 Although the state funding for the program only goes through next June, Bate is hopeful the funding will be renewed due to the class’ popularity. Even if it’s not, the county could use other funds it sets aside for senior center activities, she said. “It’s really not an expensive program. It’s free to participants, and the other instructor (Bolinder) and I have already had our training, so it’s (the only cost is) really just our time — two hours a week — and promotion of the program, but it’s been so popular it’s been promoting itself,” Bate said. In terms of long-term sustainability, the county is considering the possibility of training someone in the community to act as a volunteer instructor, she added. Bate and Bolinder are also considering adding a more advanced tai chi class. So far, they’ve only taught part one of Lam’s “Tai Chi for Arthritis and Fall Prevention” program. As for Lewis, he’s looking forward to doing the class a third time — whenever that may be.